Soon after beginning my Bachelor of Engineering in Mechanical Engineering at UL, it was with great surprise to find myself a recipient of the All-Ireland Scholarship. This completely changed the landscape of possibilities that I had envisaged for myself after finishing the Leaving Certificate. The All-Ireland Scholarship brings an extra level of freedom to its recipients. It allows one to take far bolder decisions throughout the course of your undergraduate studies. During my four years I took a seven month internship in Switzerland, spent a semester abroad at Georgia Institute of Technology and travelled to numerous countries in Europe and around the West coast of the United States. I may not have had any of these experiences, if it weren’t for the financial security granted by the All-Ireland Scholarship. At the conclusion of my undergraduate studies I had a QCA of 3.88/4.00, a first class honours degree and had contributed to several fascinating research projects. 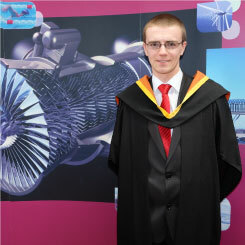 Since graduating I have been accepted to the Centre for Doctoral Training in Gas Turbine Aerodynamics with the University of Cambridge and Loughborough University in the UK; I am currently studying for a Master of Research in Gas Turbine Aerodynamics at the former. These accomplishments were achieved with hard work in conjunction with the exceptional peace of mind given by the All-Ireland Scholarship. I will always be grateful to Mr McManus and the All-Ireland Scholarship for allowing me to take the more audacious road over the last four years.